Please note, this is the rescheduled date from 22 November 2018. All original tickets remain valid, if a refund is required please see your ticket provider. The Wave Pictures have announced their biggest London headline show to date at KOKO on 22 November 2018, following the release of their two albums this year; Brushes With Happiness in June and Look Inside Your Heart in October. The band will be touring the rest of the UK in June but London fans will have to wait a little bit longer to catch the band live but it will be worth the wait. The trio of Jonny Helm (drums), Dave Tattersall (guitar & vocals) and Franic Rozycki (bass) are one of the UK's best live bands, bound together by a long entwined history and an almost telepathic musical bond. They bring unbridled joy to their performances as well as a true connection with the audience, anchored by startling musicianship and raw energy. 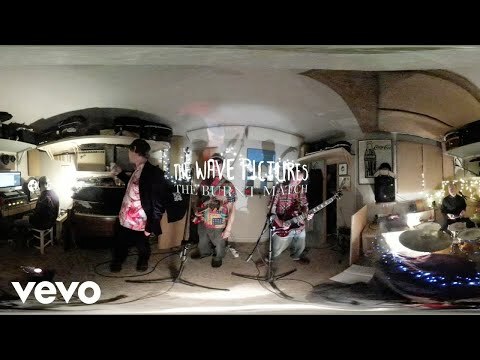 The Wave Pictures also share the video for their new single “Jim”, shot in 360° film live at The Booze Cube where the band recorded their new album Brushes With Happiness. The experience is totally immersive and makes the viewer feel like they’re in the room with the band, with the ability to scroll and look around the studio around as they please during the recording process (best viewed with Chrome or Firefox). Brushes with Happiness was recorded live to tape on one night in January playing into the wee hours. High and inebriated, they wanted to make the process as spontaneous as possible, emulating the jazz, blues and live albums that they love so much. The track “Jim” is sparse and visceral seeing The Wave Pictures in a contemplative and expansive mood. Although Dave had written the lyrics in advance, he hadn’t put them to music and hadn’t played them to Johnny and Franic before the session. None of it existed in any shape or form before they put it to tape but you can watch the magic unfold in the video. For songs recorded in this way, Brushes with Happiness really does surpass all expectations. From the languid guitar licks to Dave’s faltering vocals, every note oozes emotional truth. Brushes With Happiness sees a band at the top of their game. No other band could just improvise an album out of thin air, no trouble at all, and have it sound THIS good.